Treadmill test: Autistic children’s gait tends to be slower and stiffer than that of controls. A two-belt treadmill attached to a specialized display suggests that people with autism have a distinct walking style1. Many autistic people have movement problems, such as atypical posture, unusual gait and trouble with fine-motor control. But these problems are not considered to be core traits of the condition and are not well studied. The new setup allows researchers to record how children with autism walk and adapt to changes in treadmill speed. It could help scientists better understand how the condition affects motor skills and coordination. The setup includes a treadmill that has two belts that move independently. 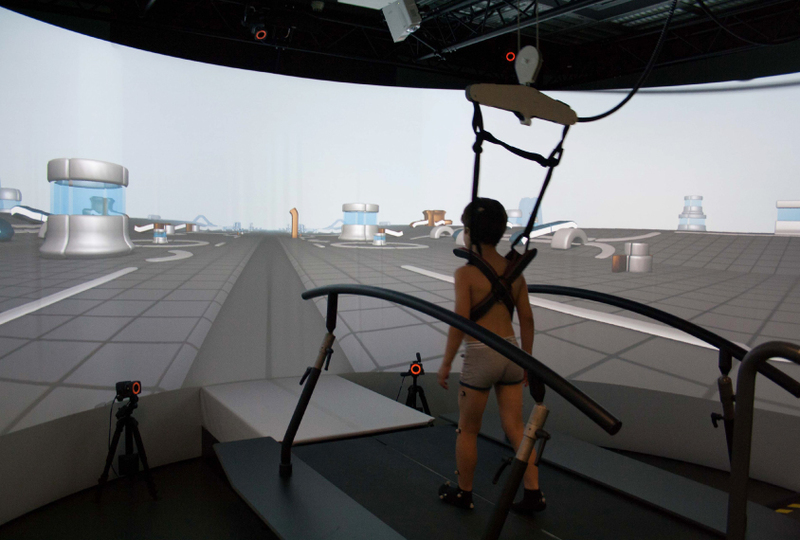 A child puts one foot on each belt and walks through a virtual environment, complete with streets, obstacles and buildings, displayed on a large, curved screen at the front of the machine. Pressure sensors in the belts and motion-capture cameras keyed into 25 stickers on the child’s body record the position of each joint, as well as the timing and force of each step. Signals from the sensors show that the children with autism walk slightly more slowly and take smaller steps, on average, than controls do. The autistic children also flex their hips less when their foot hits the ground and tilt their pelvis farther forward. When the children stumble, those with autism tend to bend their knees less than controls do. The degree to which a person shows each of these unusual motor patterns tracks with the severity of her autism. The findings were published 11 December in Frontiers in Psychology. The researchers plan to manipulate the accompanying scene to test how different visual cues affect gait.